Bacton to Happisburgh – off the tourist trail Keen amateur photographer? Make some money from your hobby. On the cliffs to the east of Happisburgh a line of wooden bungalows runs parallel to the sea. They extend as far as the public car park and the beach access at Cart Gap, where the foreshore levels off as the cliffs diminish. From here to Winterton-on-Sea the coastal defences protect the flat agricultural land. My journey continues from here to my final destination of Horsey. A left turn off the coast road just through Happisburgh leads down to the beach car park at the popular, Cart Gap. This can be a busy place during the summer months, not only with beach users, but also with boat owners and jet skiers – a substantial timber slipway is provided for their use. 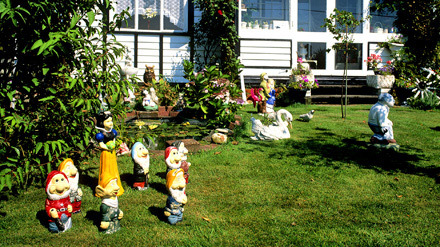 Adjacent to the car park is the entrance to the Bush Estate, a development of bungalows and seaside style chalets. This settlement – snuggled down in the lea of the marram hills – is quite extensive. It consists of several unmade roads, flanked with residences of eclectic architectural styles. There is a shop on site and many of the property owners reside there all the year round. The estate owes its existence to a proposed railway extension from Mundesley to Happisburgh, approved by Parliament in 1897, but never built. Local entrepreneurs, anticipating the large increase in visitor numbers that the growing popularity of the area, and the railway would bring, bought up land for the development of coastal holiday villages. An event that none of them could have foreseen then intervened: the ensuing 1914-18 war changed everything and the fashionable image of the area evaporated. The Bush Estate had been intended as just a development starting point, with the buildings eventually extending as far as Walcott. Lack of demand finally killed off the ambitious plans. Much of the land was requisitioned for agriculture during the 1939 – 45 conflict, and was eventually sold off to the farmers. Small plots of land were sold to individuals who then built their preferred design of holiday bungalow. Modern planning controls would make it impossible to create anything similar to the Bush Estate today, which in all honesty can only be a good thing. Having said that I do feel that it has a certain charm. The bungalows of the Bush Estate thin out into a single line along the edge of the marram hills stretching as far as Eccles-on-Sea. Beach Road leads down to the village, which now consists of just a few permanent dwellings. They are clustered around a gap through the hills, which takes you down onto the beach. The original maritime and agricultural community of Eccles was a substantial one. Flooding, around the year 1600 destroyed most of the village; in 1605 there were only fourteen dwellings left. The constant erosion of the land then continued until the church tower eventually stood alone on the beach. It was used as a landmark by mariners until it finally fell during a gale in 1895. The next village along the coast almost suffered a similar fate in 1953; Sea Palling lost seven of its inhabitants that were swept away in the floodwaters and much of the village was destroyed. Many of the original dwellings, a public house, and several business premises were lost. Most of the buildings now edge the road leading down to the beach car park or are grouped around the 14th century church of St Margaret. Like many places along the coast of Norfolk, Sea Palling has a proud history of lifeboat service. For many years two boats operated out of the village and were supported by a coastguard station. The record boards that show the details of the numerous rescues are now displayed in the church. 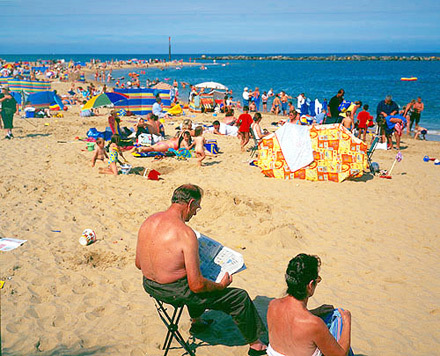 The main attraction of Sea Palling for the summer visitor is the excellent sandy beach. This has a somewhat unnatural appearance caused by the effect of the offshore reefs that form the new sea defence. On the day that I visited it was very hot, and very busy. Like many of these ancient Norfolk villages Sea Palling has a ghost story. The spirit of a woman in grey clothing haunts the Hall Inn; she has been seen on several occasions over the years. A strong smell of tobacco – without any obvious explanation as to the source – has also been noticed. A short walk from Sea Palling brings you to Waxham Hall. Built in the 16th century the Hall now stands about 200 yards from the sea. At the time of construction this distance was 14 miles. Much of the original building still stands, with a high boundary wall and a gateway facing towards the sea. Unfortunately, the arched opening is now blocked with a 20th century piece of corrugated iron. The church stands nearby, next to the imposing structure of Waxham Great Barn. The barn, constructed in 1570, was recently restored at a cost of a quarter of a million pounds. This is said to be one of the finest examples of an agricultural building in England, and is a very large impressive thatched structure. There is a car park next to the barn and a tearoom operates for the benefit of visitors during the summer months. About two miles further along the coast road you will see an unmade roadway on the left, leading towards the dunes. About one hundred yards down this track is a National Trust sign declaring custodianship of Horsey Estate. From here the track leads to a large open area used as a car park. There is a short walk to the beach. This is a secluded spot, which is very popular with dog walkers. The parish of Horsey is a small community. If you drive through you will notice that the land is well wooded, with few dwellings. You should take a right turn down a narrow road that leads you to the church, and HorseyHall – little of the Hall can be seen from the highway. It was built in 1845 for the Lord of the Manor, Robert Rising. The nearby thatched church of All Saints dates back to at least the 12th century, and some parts may be even older than that. The south wall has a stained glass window depicting Miss Catherine Rising, who died in 1890. She is dressed in a red gown, painting at her easel in the Hall. Continuing the journey you will come to the National Trust car park at Horsey wind pump. This building – restored in 1961 – stands against the edge of the road at the end of Horsey Dyke. Boats moor here in the summer having come from the Broads system across Horsey Mere. There is a walk from the wind pump along the dyke to the mere. This is an area that is popular with birdwatchers. Many visitors make use of the small shop for their souvenirs and ice creams. Horsey also has a ghost story. It is said that on warm summer nights the sounds of laughing and calling children can be heard in the precincts of the mere. In ancient times – so legend has it – bodies of dead children were not buried, but were weighted and cast into the waters. If you are interested in hearing the ghostly children, I am told that June 13th is the favoured date. Our journey is almost at an end. I hope I have whetted your appetite and that you may take time to visit the area I have described. I am sure that you will find it a rewarding experience. Time now for refreshment! As you travel back through Horsey watch for a right turn that takes you into Beach Road, where you will find a traditional public house, curiously named, The Nelson Head. The welcome will be a warm one; real ale and good food is available. 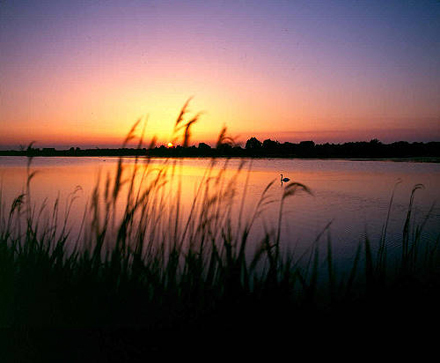 If the company is lively, and the beer is flowing, you may well meet someone who has heard the ghostly calling of the children, at Horsey Mere.